Aim: To remove pressure on the upper spine, shoulder and neck, by supporting the whole of the back, as well as removing the pressure caused by unsupported arms and bad posture. • Adjustable armrests to allow the weight of your arms to be supported in the correct position in line with your desk, so you don’t have to reach for the keyboard. • A slim-line upper back rest to support your spine, but give shoulders more freedom of movement and allow them to remain in a neutral position. • Superior adjustable lumbar support to help you adopt a better working posture. • The ability to swivel or rotate easily to prevent awkward twisting of the body. 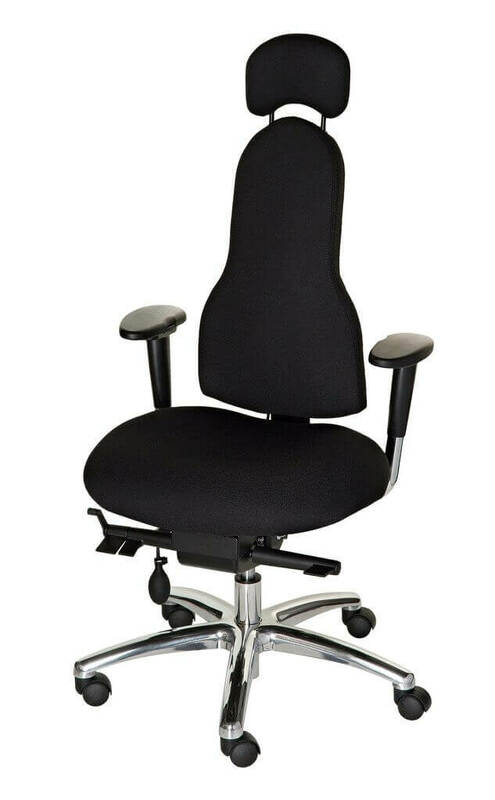 • Adjustable seat height to ensure you sit in the correct position to prevent slouching. 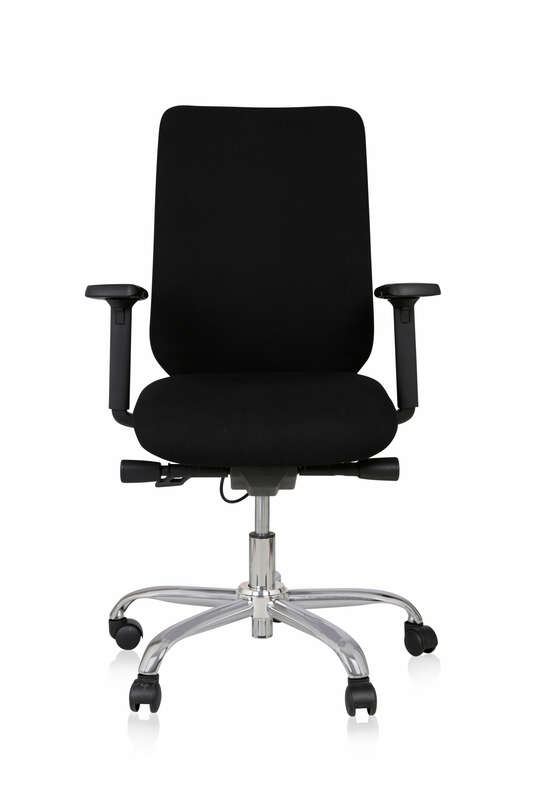 How is a Corrigo chair different to other office chairs? All of our chairs have been designed by Nichola Adams, MSc Ergonomics, Tech CIEHF, through years of physio-based research. Postural problems are the root cause of many back problems, including neck and shoulder pain. Our chairs are highly adjustable for the individual user and have been specifically designed to correct postural imbalances, and enable the optimum workstation sitting position. How can a Corrigo chair help my neck and shoulder pain? Poor posture at work is often the cause of neck and shoulder pain. A Corrigo office chair for neck pain is fully adjustable to suit you and the way you work, it supports your back and arms, and it promotes good posture, allowing you to sit more comfortably throughout the day. To reduce your symptoms and pain you need to have your arms gently supported in line with the desk, so your wrists and hands are relaxed when typing. Tension build-up is prevented when the weight of your arms is supported. Proper lumbar and thoracic support keeps your spine in its natural position and prevents slouching. Slouching is a common cause of neck and shoulder pain. Which chair is best for my neck and shoulder condition? All of our chairs are highly adjustable and come in three different sizes. Our specialist team are experts in providing the right chair for you and your specific postural problems. 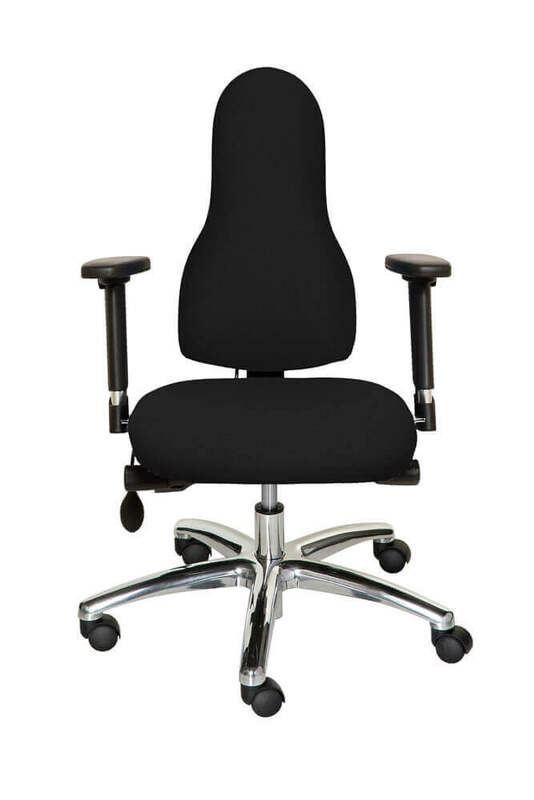 All of our chair models include height and depth adjustable armrests as standard. The Libero includes an extra width adjustability feature, further ensuring the arm rests are exactly the right width for you. To discover the best office chair for neck and shoulder pain, shop now by clicking on the Diffusion or Libero image above. How long will a Corrigo chair last? Corrigo chairs are manufactured in Britain to an exceptionally high standard. Every chair is made to order, and all come with a five-year guarantee, though we’d expect them to last longer than that. As all of our chairs are made in the UK, parts are easily replaceable from wear and tear as the need arises beyond the guarantee period. Just contact our team and we’ll provide you with a quote. What if I don’t like my Corrigo chair? We’ve not had any complaints so far, and we’ve been selling chairs since 2006. We are confident you’ll love your Corrigo chair and won’t look back, but if you really don’t get along with it, we offer a 14-day trial period, so if you’re not 100 per cent happy, you can return it to us for a no-quibble refund during that time. To make sure you get exactly the right office chair for shoulder pain or neck problems, why not come and see us and try a Corrigo chair out? We’re sorry you’ll need to make an appointment to come and see us, but that’s because we want to dedicate one of our chair experts to you whilst you are here. If you are suffering from neck or shoulder pain, and would like to know more about how a Corrigo chair can help, please get in touch with our specialist team on 0203 475 4510, or fill out our contact form here, and one of our team will get back to you. Why not let a Corrigo chair give your neck and shoulders a new lease of life?